Jane Osti is a native Cherokee artist from Tahlequah, Oklahoma, United States. 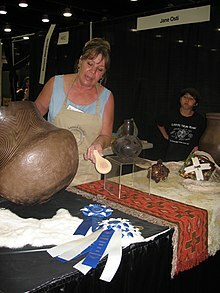 She specializes in traditional Cherokee pottery with unique embellishments and designs. In 2005, Osti was one of the youngest Cherokee artists to be appointed as a Living Treasure by Cherokee Nation. Currently, Osti teaches and creates her own pottery in her studio in downtown Tahlequah. Osti was born in the Rocky Ford area of Tahlequah. Osti's father started out as a miner and in the later half of his life he raised cattle and was a rancher. Her Cherokee mother died when she was 5 years old. Osti did not have much exposure to art until she lived alone. She participated in art class in fourth and fifth grade but did not have any other opportunities outside of that. Osti attended Oaks Mission High School. Osti was married and started a family and did not start college classes until she was 33, when she took classes at a community college in San Francisco. In 1985, Osti moved back to Tahlequah and took the rest of her classes at Northeastern State University. Osti finished her Bachelor of Arts in Art in 1989 and continued on to her master's at NSU immediately after. She graduated with her Master's of Science in Education in 1992. The classes that Osti took with professor Jerry Choate were influential for her later career as a 3-dimmensional artist. After finishing her first pottery class and while taking a Cherokee history course, Osti decided to interview Anna Mitchell for a paper. Mitchell soon became Osti's teacher, mentor, and friend. During this time, Osti switched her focus from the 2-dimensional to the 3-dimensional and really fell in love with pottery. Osti's work draws from ancient Mississippian culture and prehistoric southeastern woodland. Osti specializes in coil and slab construction, stone polishing, as well as glazing, and raku-firing. The images typically convey abstract animals and landscape with symbols of celestial activity, protection, and endurance. In 2005, Osti was one of the youngest Cherokee artists to be designated a Living Treasure by Cherokee Nation. ^ a b c Pearson-Little Thunder, Julie (May 2, 2011). "Oral history interview with Jane Osti". Oklahoma Native Artists. Retrieved 14 April 2015. ^ "Artist/Educator at Jane Osti Art". linkedin.com. Linked In. Retrieved 14 April 2015. ^ "Artist Bio: Jane Osti (Cherokee)". indiancraftshop.com. The Indian Craft Shop. Retrieved 14 April 2015. ^ "Lovetts Gallery: Jane Osti". lovettsgallery.com. Lovetts Gallery. Retrieved 14 April 2015. Hicks, Lisa. "Learning traditional pottery with Jane Osti". cherokeephoenix.com. Cherokee Phoenix. Retrieved 14 April 2015. This page was last edited on 24 January 2019, at 00:27 (UTC).